Course Description: This course enables students to enhance their musical literacy through the creation, appreciation, analysis, and performance of music. Students will perform traditional, commercial, and art music, and will respond with insight to live and recorded performances. Students will enhance their understanding of the function of music in society and the impact of music on themselves and various communities and cultures. 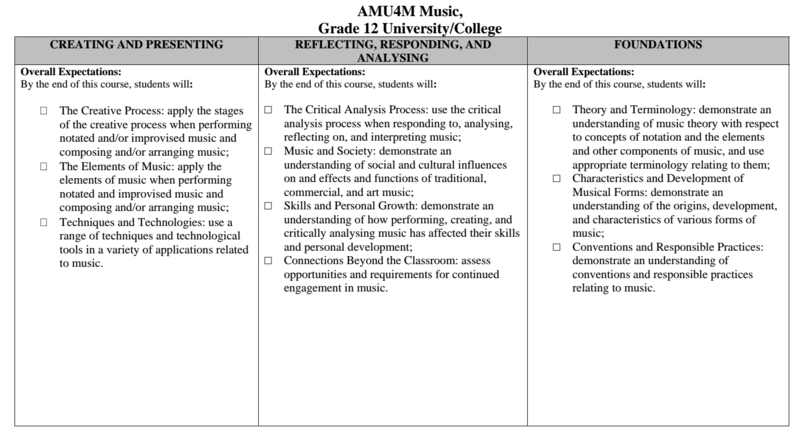 Students will analyse how to apply skills developed in music to their life and careers. In this first unit students will extend their understanding of musical scales and modes. They will examine and work with various intervals, triads, chords, cadences, and chord progressions. Students will demonstrate their knowledge through module assignments that include both written and aural aspects. In this unit students will examine and apply the knowledge and skills used to compose and arrange music. They will begin in-depth work focusing on the elements of music, transposition, instrumentation, and form. Students will create compositions and arrangements of increasing complexity in a variety of forms. In this unit students will explore music of the Twentieth Century. This unit includes twentieth-century popular music genres such as jazz, pop, and musical theatre. Students will experience selected musical works through listening, analysis, composition, and performance. These explorations provide the opportunity for students to enhance their understanding of the stylistic musical characteristics of that time period. This unit will include inquiry and analysis activities in the areas of Canadian, Aboriginal, and non-Western music with references to a cultural context as well as an examination of the relationship between selected works and their historical time period. Students will research the roles and influences, including the impact on their local economy, that music has in Canada at home and abroad. In this unit students will research and reflect on the role of technology on music from various perspectives, including that of composers, performers, and listeners. They will explore the impact of new technologies on music creation and distribution in society. Students may use a qualified community Music Teacher approved by Kanata Academy or an online qualified Music teacher will be provided for the online music sessions and assessments.